In this work, the two-excitation wavelength laser induced incandescence (LII) method has been applied in a low-pressure premixed methane/oxygen/nitrogen flame (equivalence ratio 2.32) to determine the variation of the ratio of the soot absorption functions at 532 nm and 1064 nm E(m,532 nm)/E(m,1064 nm) along the flame. 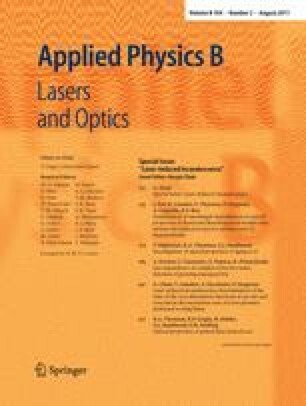 This method relies on the comparison of LII signals measured upon two different excitation wavelengths (here 532 nm and 1064 nm) and with laser fluences selected in such a way that the soot particles are equally laser-heated. The comparison of the laser fluences at 532 nm and 1064 nm leads to an easy determination of E(m,532 nm)/E(m,1064 nm). The reliability of the method is demonstrated for the first time in a low pressure flame in which the soot nucleation zone can be spatially resolved and which contains soot particles acting differently with the laser fluence according to their residence time in the flame. The method is then applied to determine the profile of E(m,532 nm)/E(m,1064 nm) along the flame. A very important decrease of this ratio is observed in the region of nascent soot, while the ratio remains constant at high distance above the burner. Implication on temperature determination from spectrally resolved measurement of flame emission is studied.